LightsGoal is devoted to the "safety, stability and fashion" LED Lighting and good after sale service to make sure our consumer have the best product experiences. 1. More heat-resistant: Made of ABS plastic, withstand higher temperature. 2. Waterproof: Made of IP65 standard waterproof material, never worry about the light rain. 3. Brighter: This waterproof grill light is twice brighter than the first generation BBQ light, see your food more clearly. 3. LED Quantity: 10 LEDs with 200 lumens of this waterproof grill light provide ultra-bright cold white lighting. 1. Don't exceed the max working temperature 131°F/55°C! 2. Do not mix Alkaline, standard (Carbon-Zinc) or rechargeable (Nickel-Cadmium) batteries. 3. Don't mix old and new batteries! 4. Don't contact with water for a long time! 5. Please use the new batteries with short circuit protection! 1. Grill light can be cleaned by wiping gently with a damp towel. But do NOT immerse in the water. 2. Remove batteries if grill light is to be unused for two months or more, since batteries could leak and damage the char broil waterproof grill light. If you have any questions or problems, please feel free to contact us. Customer satisfaction is always our priority, we will provide the best service for you. 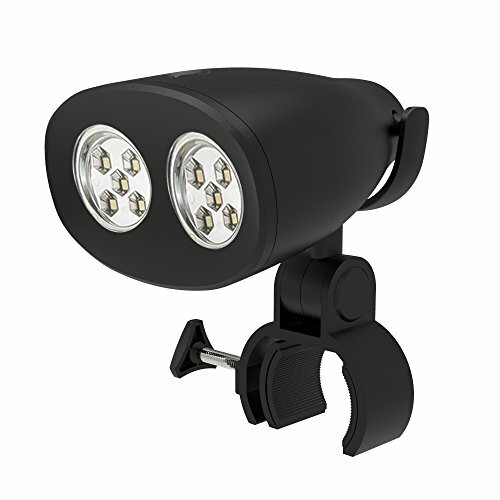 IP65 STANDARD WATERPROOF: This grill light is made of heat-resistant ABS plastic and IP65 standard waterproof material. It make sure every barbecue lover don't worry about the barbecue light when you left it outside the grill. It would be a good partner during BBQ season. EASY TO INSTALL & LONG LIGHTING: This outdoor grill light grips your gas grill or char broil grill handle well with an adjustable screw clamp. It fits on rectangle or circle bar with 1.38' (3.5cm). You can choose one of the two brightness level as your need. It provide 8-Hour lighting with 100% brightness and over 15-Hour lighting with 50% brightness. SUPER BRIGHT & HUMANIZE TOUCH SWITCH: There are 10 super bright LED lights with 200 lumen. It can illuminate a large scale of area and prevent your grill and your food from darkness at any season. LightsGoal waterproof bbq light is design for notch touch switch which is more humanize than other grill light touch design. It will not turn on/off suddenly. MULTIFUNTION: Fully adjustable 180° horizontal and 360° vertical movements so it can illuminate the whole grill surface to see your food more clearly. The BBQ light can be also clipped on tents, stair rails stably, boat and many other places it can clamp. It provide the short lighting you need. WARRANTY: 2-year warranty, 24-hour after-sales service. Any issues or suggestion about the waterproof barbecue grill light, please feel free to contact the LightsGoal customer after service via your order page, always ready to serve you! If you have any questions about this product by LightsGoal, contact us by completing and submitting the form below. If you are looking for a specif part number, please include it with your message.